Enjoy freshly baked breads cooked in a True Seasoned cast iron pan. Molded in a traditional corncob shape, your breads will add a fun flare to dinnertime. Making a great addition to any cast iron collection, this Cast Iron Corn Pan comes preseasoned with Camp Chef's True Seasoned Finish, leaving a natural cooking surface. The Camp Chef stainless steel coffee pot is perfect for camping, hunting, tailgating, and general home use. Built from stainless steel this coffee is designed to handle the rough outdoors. Camp Chef's coffee pot features a wire bail handle and includes a two piece percolator system and large fliptop lid with shatter proof viewing port. This coffee pot makes up to 28 cups (5oz servings). 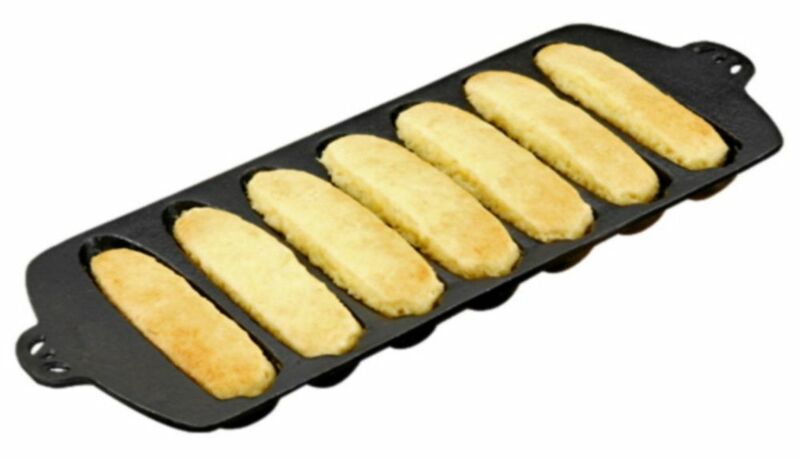 Cast Iron Corn Cob Pan Enjoy freshly baked breads cooked in a True Seasoned cast iron pan. Molded in a traditional corncob shape, your breads will add a fun flare to dinnertime. Making a great addition to any cast iron collection, this Cast Iron Corn Pan comes preseasoned with Camp Chef's True Seasoned Finish, leaving a natural cooking surface. Cast Iron Corn Cob Pan is rated 5.0 out of 5 by 1. Rated 5 out of 5 by Frank from Cast Iron Pan This cast iron pan, it is a little small but it makes lovely bread cooks evenly, doesn't stick cleanup is easy.